For the Berlin U-Bahn station, see Nollendorfplatz (Berlin U-Bahn). The place was named on 27 November 1864 after the village of Nollendorf (Czech: Nakléřov) near Petrovice in the present-day Czech Republic, a site of the 1813 Battle of Kulm where the united forces of the Sixth Coalition defeated a French army under Dominique Vandamme. The victorious Prussian troops were led by General Friedrich von Kleist, who in turn was elevated to a "Count of Nollendorf" by King Frederick William III. The adjacent Kleiststraße leads from Nollendorfplatz to Wittenbergplatz in the west. The extended square was laid out according to the Hobrecht-Plan of 1862, then part of a larger road link from Charlottenburg through Schöneberg to the Berlin district of Kreuzberg in the manner of a Parisian boulevard, named after victorious Prussian generals (therefore colloquially called Generalszug in German). During the Wilhelmine era, in 1902, the first Berlin U-Bahn line (Stammstrecke) was inaugurated, which ran under the Kleiststraße pavement up to the elevated railway at Nollendorfplatz station, built according to plans designed by Cremer & Wolffenstein architects. Severely damaged by the bombing of Berlin in World War II, the square today is shaped by the rebuilt U-Bahn viaduct and the facade of the historic Neues Schauspielhaus theatre, supplemented by numerous new buildings. The adjacent area in the south around Motzstraße is Berlin's most prominent gay village and site of the annual Lesbian and Gay City Festival. Nollendorfplatz has a long history as being a gay area which dates back to the turn of the 20th century, perpetuated by The Berlin Stories of Christopher Isherwood, the writings of W. H. Auden, Klaus Mann, and many others. Within the gay community this part of Berlin is most famous for its leather and darkroom bars. It also plays a little role in the musical Cabaret by Joe Masteroff as the home of some of the characters. 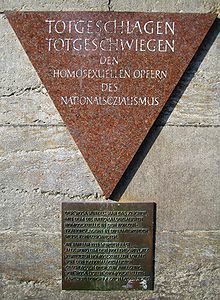 A memorial plaque at the U-Bahn station commemorates the persecution of homosexuals in Nazi Germany and the Holocaust. This page was last edited on 3 April 2018, at 16:13 (UTC).